I HAVE ADMIRED BUSHYHEAD’S ART WORK FOR MANY YEARS. MY HUSBAND ATTENDED CENTENARY COLLEGE WHERE THEY PLAYED BASKETBALL TOGETHER AND REMAINED FRIENDS UNTIL THEY BOTH WERE CALLED TO ‘THE DISTANT SHORE.’ BUSHYHEAD (JEROME) GAVE BRUCE SOME OF HIS INDIAN ARTWORK THAT I TREASURE. 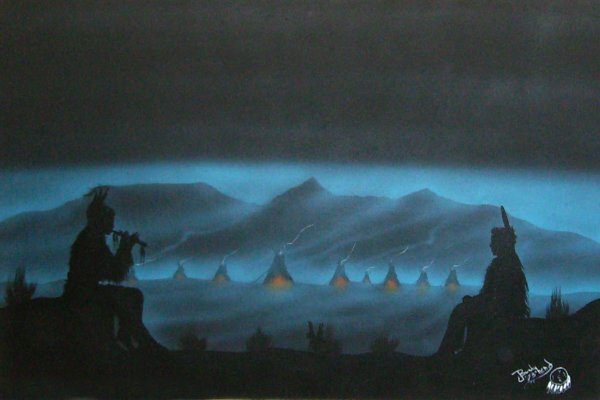 BEFORE BUSHYHEAD DIED, I CALLED AND TOLD HIM ABOUT THE DEATH OF MY HUSBAND IN 1983, AND IT WAS AT THAT TIME THAT HE TOLD ME THAT I MUST CONSIDER THOSE 8 PAINTING AS ‘COLLECTIBLES.’ PLEASE CONTACT ME IF YOU ARE INTERESTED IN DISCUSSING THESE WATERCOLOR PAINTINGS OF HIS TRIBAL INDIAN DANCERS. CHERYL DAVIS…YOUR ART GALLERY IS CAPTIVATING. I HAVE ALSO ENJOYED SEEING PHOTOS OF JEROME. I HAVE ONE OF THE CENTENARY BASKETBALL TEAM. BRUCE AND JEROME WERE THE TALLEST PLAYERS…MY HUSBAND WAS 6’8″ AND BUSHYHEAD WAS AT LEAST 6’5″.